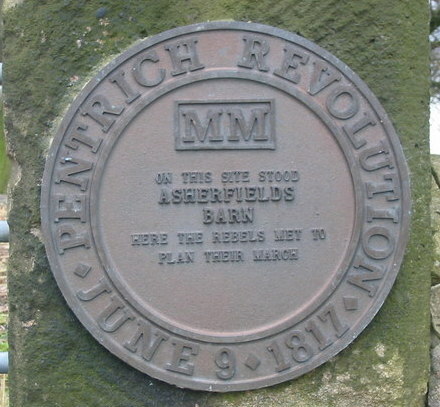 On this date in 1817, Jeremiah Brandreth, William Turner, and Isaac Ludlum or Ludlam were hanged and posthumously beheaded for the Pentrich Revolution or Pentrich Rising. Retrace the “revolution” on a walking trail (pdf). Scenic! The executions this day were an ugly consequence of government vigilance against subversives after the Napoleonic Wars. There was plenty of “subversion” to spark vigilance: economic realignments of the early Industrial Revolution pushed workers into untenable positions, and a political system overgrown with archaic privileges and undemocratic veto points could not respond pending desperately needed reform. Political Hampden clubs interested in parliamentary reform had cropped up all over England. The government viewed them as potential Robespierres. So not only the Pentrich rising’s suppression but the rising itself were the product of the state security apparatus. A government spy named William Oliver, in the employ of Home Secretary Lord Sidmouth, infiltrated himself into radical circles in the Derbyshire village, and convinced the real radicals that nationwide protests were planned for June 9. Expecting sympathetic labor actions in London and elsewhere, a few dozen Pentrich men assembled themselves — alone in the nation, drenched in a downpouring rain. They marched towards Nottingham, killed a man along the way, dissolved pathetically and were rounded up by soldiers in the days ahead. Forty-five stood trial for treason: three doomed to die this day, others sentenced to jail terms or transportation. It was a warning shot against airing grievances, a harbinger of more infamous top-down violence to come. These hangings and the throwback chopping-off-heads bit succeeded by just a few hours the sudden death of the young Princess Charlotte, a sort of Princess Di moment for the Hanoverians. Percy Bysshe Shelley, who knew from scaffold bathos, produced for the occasion a meditation on the contrasting characters of their deaths, and the incommensurate public mourning reserved for privileged royalty as against suffering subjects. On the 7th of November, Brandreth, Turner, and Ludlam ascended the scaffold. We feel for Brandreth the less, because it seems he killed a man. But recollect who instigated him to the proceedings which led to murder. On the word of a dying man, Brandreth tells us, that “OLIVER brought him to this”—that, “but for OLIVER, he would not have been there.” See, too, Ludlam and Turner, with their sons and brothers, and sisters, how they kneel together in a dreadful agony of prayer. Hell is before their eyes, and they shudder and feel sick with fear, lest some unrepented or some wilful sin should seal their doom in everlasting fire. With that dreadful penalty before their eyes—with that tremendous sanction for the truth of all he spoke, Turner exclaimed loudly and distinctly, while the executioner was putting the rope round his neck, “THIS IS ALL OLIVER AND THE GOVERNMENT.” What more he might have said we know not, because the chaplain prevented any further observations. Troops of horse, with keen and glittering swords, hemmed in the multitudes collected to witness this abominable exhibition. “When the stroke of the axe was heard, there was a burst of horror from the crowd. The instant the head was exhibited, there was a tremendous shriek set up, and the multitude ran violently in all directions, as if under the impulse of sudden frenzy. Those who resumed their stations, groaned and hooted.” It is a national calamity, that we endure men to rule over us, who sanction for whatever ends a conspiracy which is to arrive at its purpose through such a frightful pouring forth of human blood and agony. But when that purpose is to trample upon our rights and liberties for ever, to present to us the alternatives of anarchy and oppression, and triumph when the astonished nation accepts the latter at their hands, to maintain a vast standing army, and add, year by year, to a public debt, which, already, they know, cannot be discharged; and which, when the delusion that supports it fails, will produce as much misery and confusion through all classes of society as it has continued to produce of famine and degradation to the undefended poor; to imprison and calumniate those who may offend them, at will; when this, if not the purpose, is the effect of that conspiracy, how ought we not to mourn? Mourn then People of England. Clothe yourselves in solemn black. Let the bells be tolled. Think of mortality and change. Shroud yourselves in solitude and the gloom of sacred sorrow. Spare no symbol of universal grief. Weep-mourn—lament. Fill the great City—fill the boundless fields, with lamentation and the echo of groans. A beautiful Princess is dead:—she who should have been the Queen of her beloved nation, and whose posterity should have ruled it for ever. She loved the domestic affections, and cherished arts which adorn, and valour which defends. She was amiable and would have become wise, but she was young, and in the flower of youth the despoiler came. LIBERTY is dead. Slave! I charge thee disturb not the depth and solemnity of our grief by any meaner sorrow. If One has died who was like her that should have ruled over this land, like Liberty, young, innocent, and lovely, know that the power through which that one perished was God, and that it was a private grief. But man has murdered Liberty, and whilst the life was ebbing from its wound, there descended on the heads and on the hearts of every human thing, the sympathy of an universal blast and curse. Fetters heavier than iron weigh upon us, because they bind our souls. We move about in a dungeon more pestilential than damp and narrow walls, because the earth is its floor and the heavens are its roof. Let us follow the corpse of British Liberty slowly and reverentially to its tomb: and if some glorious Phantom should appear, and make its throne of broken swords and sceptres and royal crowns trampled in the dust, let us say that the Spirit of Liberty has arisen from its grave and left all that was gross and mortal there, and kneel down and worship it as our Queen.